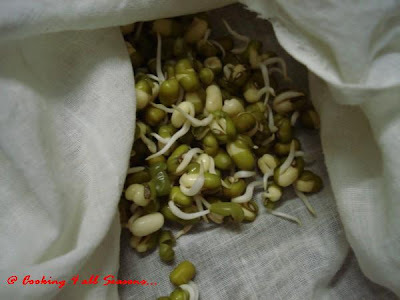 Cooking 4 all Seasons: How to Sprout ~ The Sprouting process! I was never a salad person. The buffet table laid down with tons of salads never did attract me. I could probably pick at them, but never indulge myself over a bowl. At Pizza Hut, you will never catch me wandering towards the salad bar. 'Gosh you land in a pizza joint to lavish on pizzas right, so why bother on salads' was always my thought. If I wanted to eat salad, I might as well have stayed back and made one myself. Well that's me. I can always take the cucumber, onions, tomatoes or carrots on the side, in a daily meal, but that can never be a full meal on itself! Maybe our food habits and cultural attitude never prepared us to salad way of eating. While Dad and Hubby dear insist on salads before eating, we mostly try to manage with onions and carrots. But changing times, we find ourselves getting accustomed to new ways of eating. And yes, I can now say, we have included salads and raw vegetables in some way or the other. Beginning of the year, saw us changing our food habits. We found we needed to have more energy to manage our work and family. So our food includes sprouts, nuts and raw vegetables. 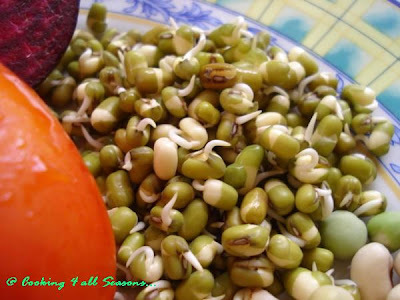 When you talk about sprouts, its always been Mung Bean sprout for us, the most commonly sprouted bean. You know Chinnu loves sprouts, and can snack on it, which I find very incredible. Since we have been eating moong sprouts for over months now, we thought we can try sprouting other beans too. Athamma is always keen on sprouting all beans. Some Nutritional information about sprouts. Sprouts are rich in digestible energy, bioavailable vitamins, minerals, amino acids, proteins, beneficial enzymes and phytochemicals, as these are necessary for a germinating plant to grow . These nutrients are essential for human health. For more information please refer Wikipedia and the list of edible sprouts. One important factor to remember is, certain sprouts are toxic when sprouted and consumed, like the Kidney Beans/ Rajma, so please read and confirm before sprouting a bean to know if its safe to sprout it for consumption. Thanks for reminding me Bee, I actually wanted to mention but missed it. Yes, the shorter the sprout, more nutrient it is. As it gets longer, it tends to become bitter and also the nutrient level goes down. Take the bean that you are sprouting, wash well and soak it in water for 6 hours, then drain the beans from water, store it in a vessel or a muslin cloth. The sprouts starts coming out overnight. 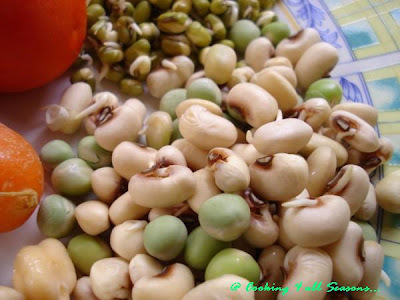 If you are planning to make mixed bean or berry sprouts, then you got to know how long each one takes to sprout . It also depends on the climatic conditions of the place you reside. I am giving details based on our climatic conditions. After sprouting Moong dal and enjoying it over months, we have now moved to sprouting other beans like Chick pea, Peas, Black Eye Pea, Wheat Berries. We either eat them as such raw, or par boil it for few minutes and make a salad. You can even stir fry it to make it more edible. But my catch you, if you eat this regularly you will get used to it. All these beans take about the same time to sprout. All these have to be sprouted separately. Wash the beans and soak in water for 6-8 hours. Then drain the water from the beans. Store these separately for about 6 hrs or overnight. By morning, you will find the sprouts, Store these in fridge to prevent further sprouting. When you store in fridge, the sprouting speed is reduced but not stopped. Follow the same process as above, but this takes few more hours extra for sprouting to start. 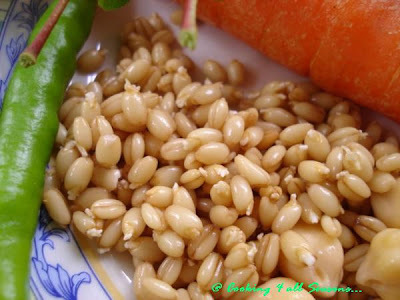 Wheat berries take the longest time to germinate. Soak the Wheat berries for 6 hours, then drain in and store in a vessel overnight, Next day you can again wash in water and drain and store for another 6 hrs.Totally it takes about 2 days for a Wheat Berry to sprout. When you have all the beans sprouted, you can make a mixed sprout salad with or without adding vegetables. 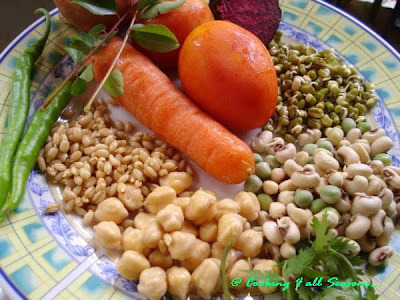 Since Moong dal, Peas and Black Eye pea are soft, they can be consumed raw. But you can parboil the chick pea and Wheat berries before eating them. Also since these sprouts are rich in enzymes and mineral, its advisable to consume in small quantities. I am sending this to my Ninja friend Divya from Dil Se, who is hosting the Weekend Herb Blogging. WHB, is an event started by the lovely Kalyn of Kalyn's Kitchen.